Today, one in three journals has access to iThenticate for editorial support in checking submitted manuscripts for plagiarism prior to publication. Since the various forms of plagiarism are often misunderstood and mistakes are often accidental, professional researchers' and writers' reputations and careers are potentially at risk. Increasingly, writers are checking their work before submission to journals to reduce any risk. While pre-checking one's own work can help ensure originality and proper attribution, the generated results or report may also prove to be a useful tool when submitting to a journal. Add an iThenticate logo or badge to the manuscript. A "stamp of originality" shows that the writer is aware of plagiarism software, and that he/she potentially upholds a high standard of research integrity, and takes a proactive approach to avoid any accidental plagiarism. Include or attach a copy of the iThenticate report with the manuscript. 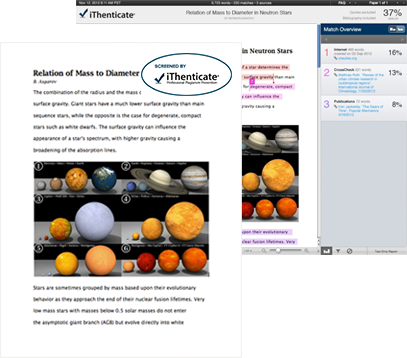 Reports in iThenticate can be downloaded in PDF format. Although publishers most likely will run their own check of the manuscript, attaching a copy of the report gives publishers an initial view of the results and a comparison tool. Download one of the below badges/logos (right click and save), then upload the image to your paper. There is no cost to use these images, and customized badge requests are created free of charge. Optional: Hyperlink the image to http://www.ithenticate.com.